The Sustainable Business Coalition of Tampa Bay and the University of Tampa celebrated 7 winners of the 2014 Sustainable Business Awards luncheon last month. 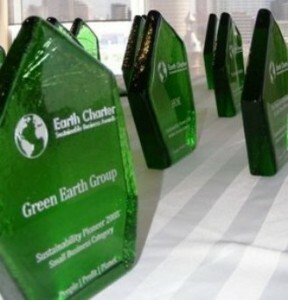 7 businesses took home a Sustainable Business Award. The award recognizes each business for “outstanding sustainable business practices and their commitments to people, planet and profit.” Each of these businesses makes Tampa Bay a healthier, better place to live. Elutions Inc. – which offers clients energy management solutions for buildings. Given that buildings account for about 40% of greenhouse gas emissions, products that help buildings use less energy make a huge difference. Triad Cleaning Solutions – This company offers green cleaning products and services that improve indoor air quality for clients. And for commercial clients, using such products enables them to apply for LEED certification. Bayshore Solutions – This web design, web development and digital marketing solutions company is a repeat winner. It’s good to see businesses become greener each year! The Refinery – This farm-to-table restaurant does a fantastic job. (I’ve eaten there.) According to their website, “we set the bar high when it comes to what we put on the plate. If it wasn’t grown in Florida or produced using ethically sound methods, you probably won’t find it here.” ‘Nuf said. Advanced Healthcare Partners. This is a health management and consulting company. At the Awards luncheon, AHP announced that they were becoming Regenerative Medical Solutions (RMS). RMS/Lung Institute utilizes stem cells from the patient’s own body to treat lung disease. Suncoast Food Alliance – Tampa has a growing “farm-to-table” movement. This company helps put farmers together with chefs, so that their fresh produce, eggs or meat get to the restaurants at the peak of flavor. Landmarc Contracting -This construction and renovation firm is a certified Lead-Safe business. According to the EPA, “Home repairs that create even a small amount of lead dust are enough to poison your child and put your family at risk. If you live in a home or apartment that was built before 1978 and are planning a renovation or repair project, make sure you renovate right with a Lead-Safe Certified contractor.” Like Landmarc. Congratulations to all the winners! And kudos to the Sustainable Business Coalition of Tampa and the University of Tampa for hosting this event. Until next year!